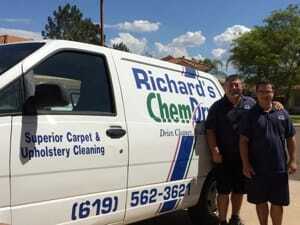 Richard's Chem-Dry is an independently family-owned and -operated company that specializes in cleaning carpets, rugs, upholstered furniture and much more. We make use of a green-certified solution that is safe, eco-friendly and non-toxic for children and pets. Whether it is pet odor or stain removal, you can count on us. Since 1989, we have been offering a broad range of cleaning services to all our customers in San Diego and the surrounding area. We make use of 80 percent less water so that your rug or carpet will dry in 1 to 2 hours instead of 1 to 2 days. Rely on us for all your residential and commercial carpet cleaning services. Our professionals ensure that your work is done right and on time. For more information about our services, give us a call at (619) 592-8349 today. We will be there to assist you. Call Now to Learn More About Our Specials!